I kept this post in a draft form because it is special to me. But after reading a post on LI that it is 125 years since the death of Van Gogh. I decided to post mine to share. It was a rare opportunity to visit a home garden in spring. For a composition, I looked down from a deck into a garden corner and decided that she's mine. It looks ambitious. It looks overloaded. I knew with the sweeping wash and mute colour movement at the moment in watercolour art scene, I think this is the one that would be avoided by many watercolour painters at all cost. "What are you going to do?" asked one of my friends. "Paint it, I am going to paint it" I replied. I know people might think I was out of my mind. At the same time I was not so sure. Facing the challenge of nature with its intensity and complexity is not easy. I might fail but that was the point. If I did not seize the opportunity to stretch my boundary now, I would never do it. Looking at all dazzling colours in front of me, I thought about one of my heroes, Vincent Van Gogh. I thought about Van Gogh because he came from the land of flowers. He was fearless in his approach to painting direct and was brilliant in portraying the essence of nature with its complexity. With that thought, I did not have much to lose but a lot to gain. I jumped straight in capturing the flowering honey suckle wall, the garden furniture set, the pots full of bulb flowers, a small blossom tree and finally few black birds! I though about the tulip fields of Netherlands as I added the red tulips to the pot on the table. 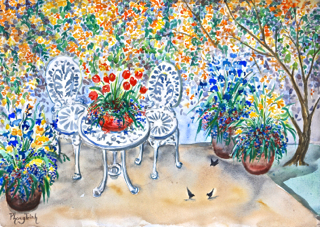 I thought about the blue iris field he painted as I added blues irises to the pots around the table. I tried to keep to colours pure, intense and raw with descriptive strokes capturing features of elements (the technique I saw in his paintings) in the same time I tries to retain the glittering effect of sun light. This is, if I may, a tribute to Van Gogh, a master who showed me the joy and excitement in nature with his brilliant and "could not be more direct" technique! It took courage to capture the "Wow" factor in nature the way he did. "That courage and soul have become Van Gogh legacy! " was my thought. When I look at my " Spring in the Yard", I feel dazzled and happy. I think I have captured the effect of spring in this garden corner. I realised the biggest benefit of living with art is an opportunity to live with a soul! I feel humble.